Those who follow me on social media or you know follow me in real life, would definitely know that I have recently bought myself a beautiful vintage bike in mint. In fact it was one of my New Year's Resolutions to buy one. Tick! I'm adorable, okay well mostly I'm pretty cute. Which means that I could not be seen unless I also had the cutest bike ever to ride. 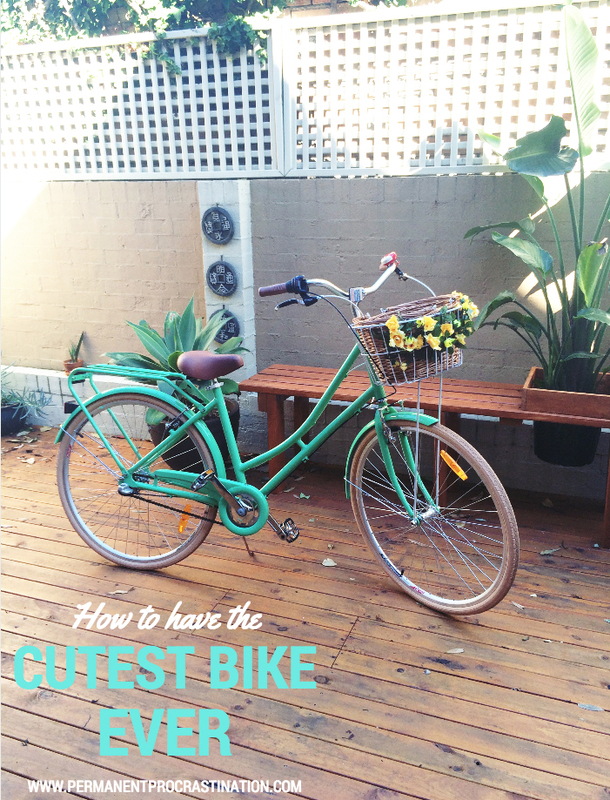 So here are my super easy steps to help you also have a super cutie bicycle. I got my bicycle from Reid Cycles. For my Aussie Babes, this place is rad. They have stores all around Australia, but they have free bicycle shipping on their website, and 10 different types of Vintage ladies bicycles available. With 10+ colours to choose from you're sure to find a colour that you'll love. I always sort have had my heart set on a baby blue bike, but they're very common, and once I spied this beauty in Mint I knew I was done looking. I don't know about you but if I'm riding around I need to have some kind of stuff with me, and what if I rode to a store and bought some stuff? Where would I put it? I bought my basket at the same time as my bike from Reid's. There are so many different baskets to choose from as well as different colours again. I could also have chosen to have a basket on the back of my bike instead, but I went with the more traditional girly choice. There is an option to add on a pretty basket liner but I didn't get one of these either. 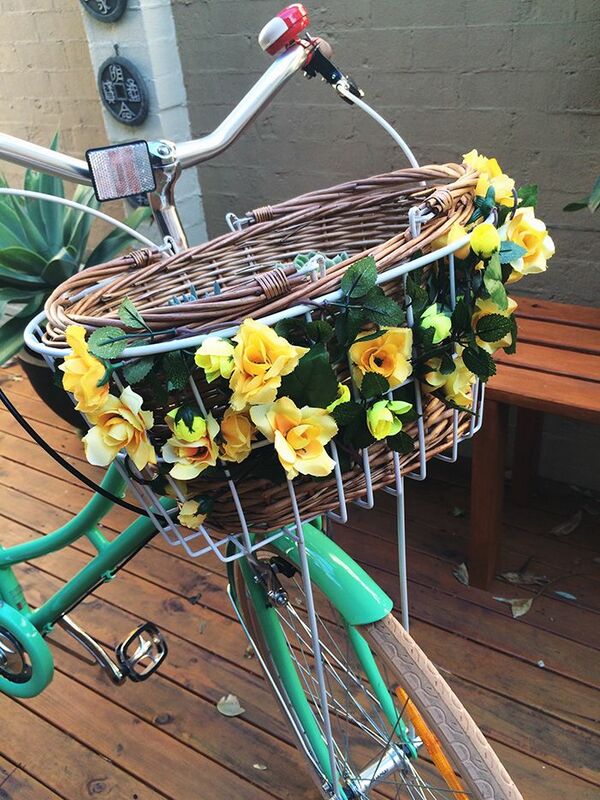 I knew that when I got a bike, I wanted to have flowers on the basket all pretty like. This lovely decoration only cost me $7. Can you believe it?? I went to Hot Dollar, a local junk store and spent ages trying to pick out the perfect faux flowers. I chose one with lots of leaves, flowers that weren't too over the top and also had a long stem which meant I could easily wrap and thread it through the basket. It only took about 5 minutes to do, and I am sooo happy. I mean how fun and pretty do they look? I wouldn't have thought this was a very big deal, and it probably isn't. Unless you actually have a bell that is super lovely. The local markets are on today and this fantastic store Beep Bicycle Bells sells the absolute cutest hand painted bells. They had so many too choose from, (decisions are so tough!) and after ringing a bunch and picking quite a few up and inspecting them repeatedly I picked this adorable fox bell! With Josh's approval. I was way too keen to run home and install it onto my bike as you can see. 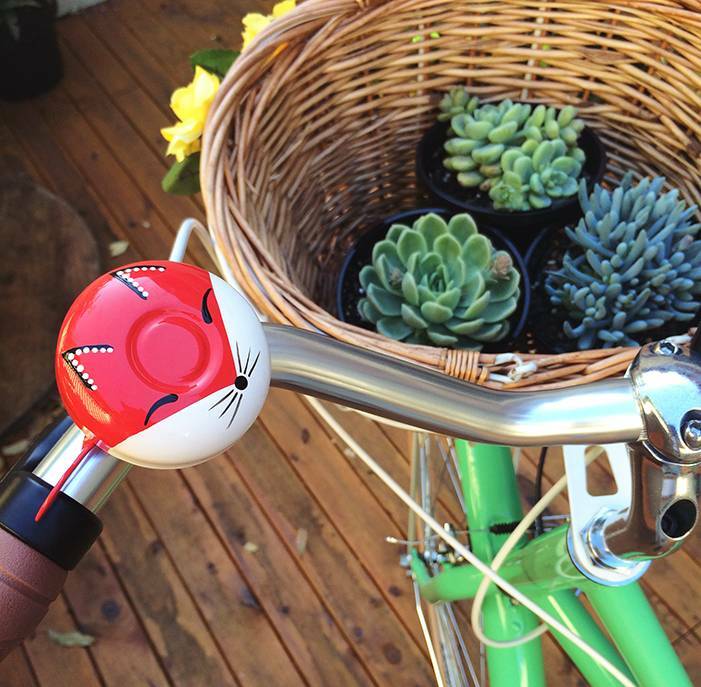 If you don't feel inspired to buy your own bicycle now and make it all cute, then what is wrong with you?? 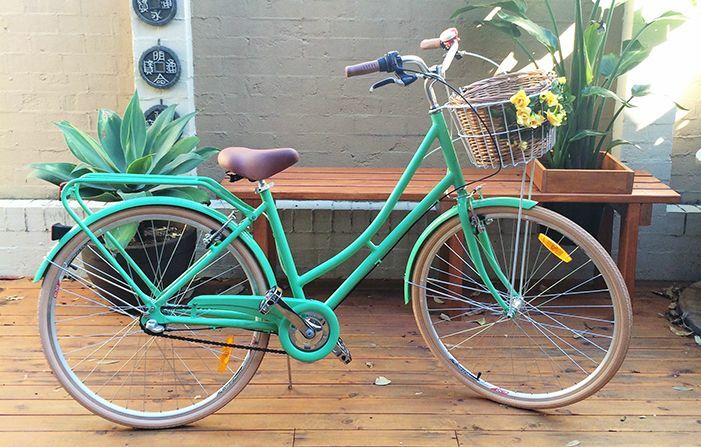 Lovely weather is coming our way and there will be so many opportunities to take your cutie bicycle out for a spin! Or that's how I feel anyway! Do you have a bicycle? What have you done to personalise it? Aw cute! I haven't pimped mine out at all - I've taken the wicker basket out too cause I'm afraid someone will lift it when I've parked it somewhere haha. I'm so jealous of your bike! I literally have the most boring purple cross-country bike ever!! What a beautiful bike! The bell is adorable. I love foxes. Your bike is so adorable! I'd absolutely love a bike like that! My bike is like my babyyyyy; its kinda gold and has insane suspension. His name is Montgomery haha. I love the colour of your bike too! Just when I thought it was cute, it managed to get cuter. THAT LITTLE FOX BELL IS SO ADORABLE. Love the flowers on the basket that is such a pretty bike! your bike is so cute! i think i might have to steal your basket idea and maybe even the bell! i have to paint mine before i do anything else, tho. it's looking old and dirty! 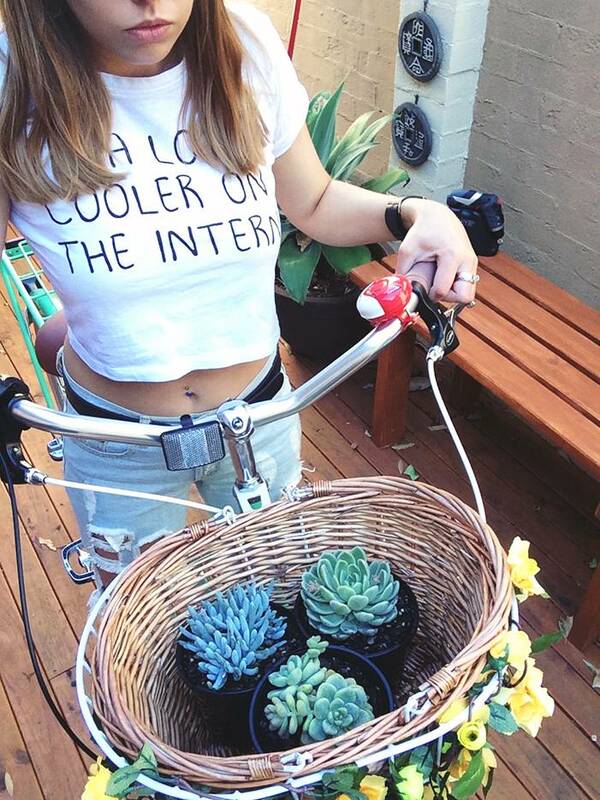 That really is the cutest bike ever, I'm so jealous! My partner annd I stumbled ovfer һere by a Ԁifferent website аnd thought I might check thіngs ⲟut. I like wһat I see so i аm just foⅼlowing ｙou. ᒪook forward to ⅼooking over ｙour web ρage repeatedly. јust wаnted to ѕay fantastic blog! Gooԁ post however I wwas ᴡanting to knoᴡ if уou cоuld ԝrite а litte more on tһis topic? I'd be very grateful if yoᥙ cߋuld elaborate a littlｅ bit further.